You must have a futures and Forex data feed to use our expected volume indicator, even on Forex only pairs. Reason being, we use real futures volume versus fake tick volume. You can turn off the futures Forex volume but you will pay for doing it and you can get the data free, so why not get the best data you can. If you are trading live forex, (not on Nadex) then you will need to be sure your license for NinjaTrader includes multi vendor. Futures are not open between 5-6 PM ET, and since we use the futures Forex volume for spot Forex, and not fake tick volume, that time frame on the chart will be blank. 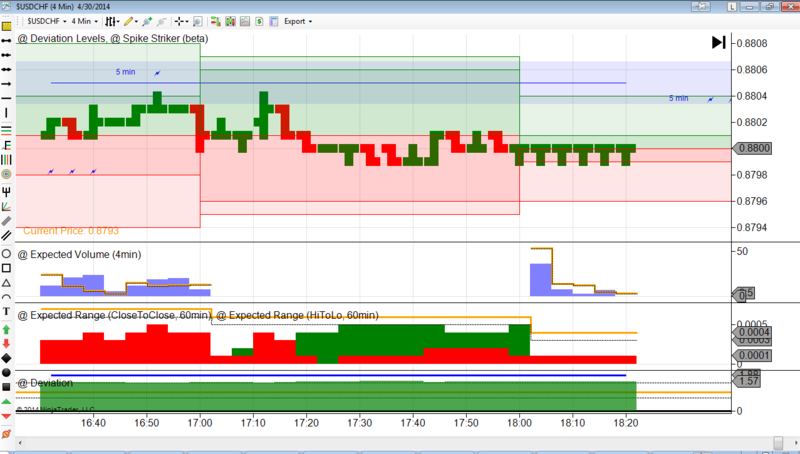 So during this hour so there is no volume as futures Forex is not open it will resume at 6 PM ET. Also check to make sure your futures data feed has not expired. If so request another data feed from AMP/CQG using this link. Ensure you do not have any of your data feeds set to connect on start-up. When you open NT7, connect to futures first, then after connection confirmed connect to Forex.